Lyn is one of my oldest customers--no. not in age!! I've been quilting for her for over nine years--in fact, one of my first quilts for her popped up in my memories on Facebook just the other day! I remembered that quilt. When I finished I hung it in my studio and just stared at it. Crazy!! This one is called In and Out and looked like it was fun to make. (Unfortunately, my camera didn't do it justice. The colors were so much more beautiful in person. Several times I have received quilts in the mail unexpectedly. It always surprises me to get a box and not remember what I've ordered only to find its an unfinished top! Then I start looking for a note to see who sent it. That's what happened with this one. I couldn't resist calling Connie and thanking her for the lovely quilt top!! This year, the Cabin Fever Quilters decided to go modern with their raffle quilt. They made a Tula Pink Butterfly. Isn't it lovely?? (Ignore the circles you see on the background fabric. They're showing through from the backing.) The background is actually a solid, very light gray. Karen called a few weeks ago and wanted me to quilt a shop sample. When I stopped by to pick it up, I was thrilled! Isn't this the cutest thing ever??? I saw all that white negative space and got very excited! Karen gave me free rein to play, so I did! The first thing I wanted to do was connect the elephant to the butterfly, thus the feather from the end of the trunk to tie them together. Here's a look at that a bit closer. 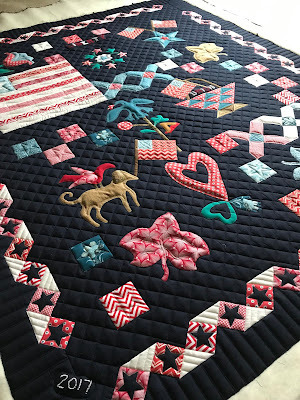 In 2017, the Quincy Crazy Quilters retreat theme was Laura Heine. Laura does all those great collage quilt patterns. I chose to do Frieda the Fox; Becky chose the bicycle (a pattern that's no longer available). During the retreat she kept asking me how I would quilt it. Then at the 2018 retreat, she brought it with her and I got to bring it home! Okay, it really wasn't a test. It was just funny! The week prior to picking up Anna's cute bike quilt for quilting, Becky gave me a much larger bike quilt to quilt. I teased them both about Anna's being the test run for the real thing! Isn't this the cutest panel ever??? Clara framed this adorable bear with this fun background for a little boy who has some special medical issues. It was an honor to quilt it for them both. She even sent me a picture of Thomas with his quilt. He looked pretty darn happy. I used my heatwave pattern in the busy background, but on the white, I did little geometric blocks around the bear. The bear got some special quilting, but it didn't show up very well in the pic. Sorry! Leslie has been busy and I'm falling behind...although I do have a good excuse. I had a total hip replacement on December 4, which set me back a bit. Thankfully everything went well and I'm back to quilting. And to be honest, Leslie sent this way before the hip replacement; I'm just slow getting the blog caught up! She called this the Big Four of Yellowstone. It was a beautiful panel and a quick quilt due to its size. I love these little projects. Nothing adds a little of everything to ones life like a baby. A little more love, a little more joy, a little more mess, and little more noise, but it is all worth it in the end. Lisa added a little more to her repertoire of quilts with this plus baby quilt. Made of only three fabrics, it is simple and elegant. The colors are cool and relaxing, making it a little more likely for a young active mind to settle down and sleep. 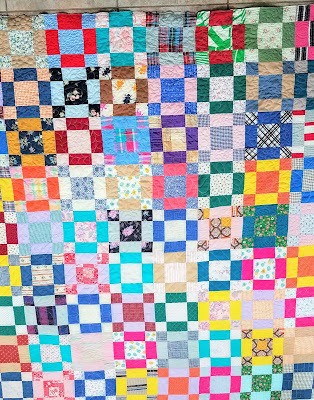 This quilt is just amazing and made more so by the fact that Carolyn didn't make this from a kit. She chose her fabrics carefully and the result was spectacular! Don't you love how the colors flow??? 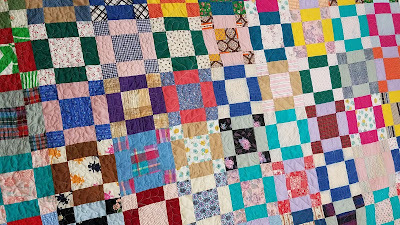 This quilt just needed to be held together--it didn't need any quilting that would detract from the lovely piecing. I quilted this using a bunch of inter-connecting straight lines. The border was more straight lines with a "plaid/crosshatch" effect in the corners. Mrs. Bertha is a guild friend who has asked me to quilt a top that she "inherited" from a friend. The short story is that the woman who made the quilt tops is someone I knew as a little girl. Mrs. Mary Lee was mom and dad's neighbor from the time that we moved to Plaucheville until her death. They are all gone now, but some quilts and tops made by these neighbors are still around. This is the second quilt, made with the same fabric line. This is going to be used as a tablecloth for her trailer, if I'm remembering right. This was more challenging to quilt...not a lot of open space. Rather than trying to follow the design on these blocks, I opted for some linework--both curved and straight. This is the center panel with curved lines meeting in the middle. And a shot of the back. I always love how the quilting looks on plain backs...especially black ones! Sigh.....big Sigh Christmas shenanigans are done!! Loved every minute with my crazy family. Individually they a bundle of energy each, get them in one room and it all grows exponentially! It was a wonderful day. I was able to sneak down to the long arm and get a few stitches in before everyone got here. Pulled off this beauty from the frame. Well, it is the end of yet another year. Wow, this one went by fast. 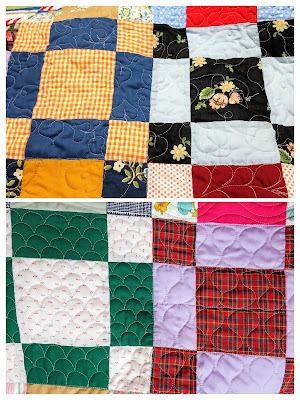 I fell in love with these quilts while working on them. The fabrics are just so beautiful and Leslie did such a good job piecing them. The first she called "Southwest Pantry" (I think. I'm terrible at remembering names!!) Lots of pics on this post, so you might want to grab a cup of coffee!! First, a pic of the whole thing: front and back. Nope...I didn't get to go on vacation. But I did get to work on Ginny's quilt and she did go on vacation, took this picture, and made it into this beautiful quilt. meander. I also used mono-filament thread. Something I rarely do; however, with this quilt, it was a necessity. I would have been changing thread color every inch! !